18 holiday images in 300 dpi format, with transparent backgrounds--This 18 piece set includes a black and white outline tree! This is my Merry Little Christmas set of cute trees and extra things to decorate your holiday files. All trees are hand-drawn and brightly colored for the holidays. Decorate a tree or two! 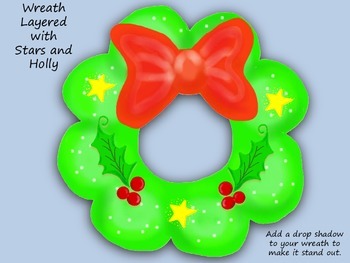 Decorate a wreath or two! Decorate with berries, stars, bows and candy canes! Layer them and combine them to create your own personal designs. There are 18 pieces in all! They are all 300 dpi png images with transparent backgrounds. They are fun to layer, enlarge, stretch, or skew. Trees can be made tall, short, wide or skinny! Great for just adding that little festive touch to your documents. For personal or commercial use--Please read the terms, which are standard copyright terms. I do ask that you include my store URL and name for credit on your document for any free or paid creations. Thank you so much for stopping by and checking this out. I hope you enjoy these as much as I had fun making them! If you use these images for your projects, please leave feedback. It helps me improve my work!